Eliminate blackheads, dulling dead skin cells and toxins. This deep cleansing, gentle, exfoliating treatment refreshes, brightens and eliminates impurities. For all skin types who want a gentle, deep cleansing that will brighten and even skin tone and reveal more youthful looking skin. On clean skin, apply a small quantity all over face and neck half an inch away from eyes. Using warm water, work it gently with wet fingertips. Leave on for 2 minutes, dip fingers in warm water and work in gently again then rinse thoroughly with warm water. 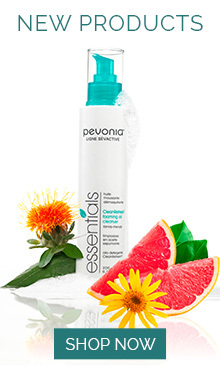 Cleanse skin gently but thoroughly with Phyto-Gel Cleanser or twice with any other Pevonia cleanser. Use once or twice a week. Follow with any Pevonia lotion. Water (Aqua), Sodium C14-16 Olefin Sulfonate, Glyceryl Stearate, Stearic Acid, Zea Mays (Corn) Starch, Papain (Sphérulites), Bromelain (Sphérulites), Carthamus Tinctorius (Safflower) Seed Oil, Titanium Dioxide, Saponaria Officinalis Leaf/Root Extract, Ginkgo Biloba Leaf Extract, Calendula Officinalis Flower Extract, Anthemis Nobilis Flower Extract, Arnica Montana Flower Extract, Aesculus Hippocastanum (Horse Chestnut) Seed Extract, Ananas Sativus (Pineapple) Fruit Extract, Carica Papaya (Papaya) Fruit Extract, Phenoxyethanol, Caprylyl Glycol, Ethylhexylglycerin, Hexylene Glycol, Hydroxyethylcellulose, Citric Acid, Dimethicone, Sodium Citrate, Citrus Limon (Lemon) Fruit Extract.